And all of us who shoot digital also are carrying a full computer rig, including laptop, hard drives, cables, a mouse, SD/CF card readers, etc. The weight limit on Virgin Atlantic is so strict that my computer gear is going on board in a shopping bag because my padded computer knapsack put the gear into the 15lb range – a big no-no and an enticement to apply the baggage compartment death sentence to my computer. 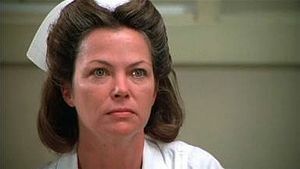 Nurse Mildred Ratched is the main antagonist from Ken Kesey’s 1962 novel One Flew Over the Cuckoo’s Nest, as well as the 1975 film. A cold, sadistic and passive-aggressive tyrant, Nurse Ratched has become the stereotype of the nurse as a battle axe. She has also become a popular metaphor for the corrupting influence of power and authority in bureaucracies such as the mental institution in which the novel is set. So, instead of a relaxing air voyage to exciting distant shores and new adventures, I’m approaching check-in with trepidation and fear that Nurse Ratched will be waiting at the head of the check-in line to ferret out those illegal ounces and evil pounds over the 13 lb. limit she has sworn to uphold.